No. 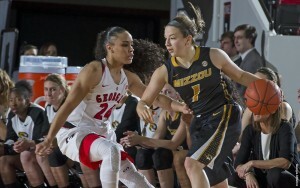 20 Mizzou Women’s Basketball (14-1, 1-1) defeated Georgia (12-3, 0-2) 54-48 Thursday evening at Stegeman Coliseum. Jordan Frericks (Quincy, Ill.) and Cierra Porter (Columbia, Mo.) both finished with 11 points to lead the Tigers. Porter added eight rebounds while Frericks grabbed six boards. Mizzou got off to a strong start in the first quarter as the Tigers held a 15-6 lead after the first 10 minutes of play. Porter led the way with five points while Frericks added four points and five rebounds in the opening period. The Tigers increased the lead to double digits at halftime, holding a 31-21 advantage at the break. Mizzou shot 58 percent (11-for-19) during the first 20 minutes while holding Georgia to 26 percent (6-for-23) from the field. Morgan Stock (Town & Country, Mo.) provided a spark off of the bench with seven points in the first half, including her 100th career 3-pointer. She also grabbed four rebounds. Georgia opened the second half on a 10-2 run and outscored Mizzou 19-7 in the third quarter to take a 40-38 lead into the final period. Mizzou went on a 10-0 run in the middle of the fourth quarter as the Tigers outscored the Bulldogs 16-8 over the final 10 minutes. Porter put Mizzou ahead for good at 44-43 with a layup at the 3:57 mark. For the game, Mizzou shot 38 percent (17-for-45) from the floor and went 5-for-17 from 3-point range and 15-for-26 from the foul line. The defense held Georgia to 26 percent (13-for-50) shooting from the field and 26 percent (6-for-23) from long range. Shacobia Barbee recorded a double-double with 10 points and 14 rebounds to lead Georgia. The Tigers return to play Sunday, Jan. 10 at No. 2 South Carolina. Tipoff is scheduled for 11 a.m. CT on SEC Network.